A single-wing tailback in college, Graham chose to sign with the Browns of the new AAFC rather than the NFL Detroit Lions, who had drafted him in the first round in 1944, after coming out of the Navy. An outstanding athlete, he first played pro basketball before joining the Browns for the 1946 season. Mobile and an accurate passer, Graham threw for 1834 yards as a rookie and led the AAFC with 17 TD passes as the Browns won the league championship. He was the league’s MVP for the first time in ’47 as he led the AAFC in overall passing as well as completion percentage (60.6), yards (2753), TD passes (25), and yards per attempt (10.2). Graham was co-MVP with San Francisco’s Frankie Albert in ’48, a season in which he once more led the AAFC in passing yards (2713) while tossing another 25 TD passes and the Browns went undefeated. The Browns won the AAFC title for the fourth straight year in 1949, and Graham led the league in passing yards (2785) and yards per attempt (9.8). While no MVP was awarded by the league, he was a consensus first-team All-AAFC selection. Graham and the Browns moved to the NFL in 1950 and kept up their winning ways by achieving another championship. Graham was selected to the Pro Bowl. He was named league MVP by UPI in ’51 as the Browns went 11-1, although they lost the Championship game to the Rams. 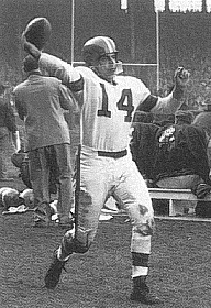 The Browns reached the NFL title game and lost again in 1952, and Graham led the league in pass attempts (364), completions (181), yards (2816), and TD passes (20), as well as interceptions (24), and was once again named to the Pro Bowl. Browns went 11-1 to finish first in the Eastern Conference. Lost NFL Championship to Detroit Lions (17-16). Cleveland won the Championship games following the 1954 and ’55 seasons (the latter after Graham was coaxed out of retirement to play one more year) and Graham led the league in completion percentage in each of his last three years as well as TD percentage (8.1) and yards per attempt (9.3) in ’55. Altogether, over 10 seasons (four in the AAFC, 6 in the NFL) Graham averaged 9.0 yards per attempt (a record 8.6 in the NFL alone) while throwing for 23,584 yards (10,085 in AAFC, 13,499 in NFL) with 174 TDs (86 in AAFC, 88 in NFL). He also ran for 882 yards and scored 44 TDs, with a high of 8 in 1954. He was a first-team All-league selection three times in the AAFC as well as three more times in the NFL and was chosen for the first five Pro Bowls. Perhaps most significantly of all, he quarterbacked Cleveland to a championship game in all ten years, winning seven of them. The Browns retired his #14 and he was inducted into the Pro Football Hall of Fame, Class of 1965.